Introduction – Bhimbetka represents a rare primary prehistoric site, which is one of the most ancient in the world, yet in its pristine state. It is a living site set in its natural environment. Its uniqueness is not only the concentration of art and antiquity, but that it has not remained frozen in time and peace. Elements of continuity are manifest in the creative expressions that show affinity to great antiquity in the traditional lifestyles of the area integral to Bhimbetka and the surrounding areas. The hill range that contains painted rock-shelters rises over 600 meters above the mean sea level. The 1892 hectares of core area comprising of five hills namely Bineka, Bhonrawali, Bhimbetka, Lakha Juar (east) and Lakha Juar (West). The Bhimbetka group of hills is formed of sandstone of the Lower Bhander Group of the Vindhyan Super Group, the oldest geological formation. This rage runs east-west for length of more than 8 km. Bhimbetka with over 700 rock shelters in its environment, is the largest hill in this range. Archaeological evidence at Bhimbetka show continuous sequence of cultures from Paleolithic to the Historical period. 1. Bhimbetka reflects a long interaction between people and the landscape, as demonstrated in the quality and quantity of its rock art. 2. Bhimbetka is closely associated with a hunting and gathering economy as demonstrated in the rock art and in the relics of this tradition in the local adivasi villages on the periphery of this site. Executed mainly in red and white with the occasional use of green and yellow, with themes taken from everyday events, the scenes usually depict hunting, dancing, music, horse and elephant riders etc. Animals such as bison, tigers, lions, wild boar, elephants, antelopes, dogs, lizard etc have been depicted in some of the caves. More than a dozen rock shelters on Bhimbetka Hill can be approached by the visitor. Proper pathways are constructed to visit these few shelters. However there are no pathways for other shelters on the hill. Take a proper guide if you want to explore those rock shelters. In 1867, twelve years before the discovery of the paintings of Altamira in Spain, Archibald Carlleyle discovered paintings in the caves and rock shelters at Sohagighat in the Mirzapur district of Uttar Pradesh and claimed Stone Age antiquity for the paintings. The first reference to Bhimbetka was made in 1888 by W. Kincaid, published in a paper on information from the local inhabitants for the purpose of reconstruction of the history of the Bhojpur Lake wherein he refers to Bhimbet hill as a Buddhist site. Since then no one seems to have visited Bhimbetka to report its rich heritage until it was discovered by V.S. Wakankar in 1958. He carried out intensive survey of the region and divided the paintings into seven topographic areas (I-VII). He further sub-divided each of these areas into clusters of groups of shelters, which he named alphabetically (A-F). Finally he numbered individual shelter in each cluster in Arabic numerals. This three-tiered numbering is followed till now as a standard. Mathpal later added a simple letter for the missed out shelters in previous surveys. Monuments – Out of the five hills, only Bhimbetka hill rock shelters are easily accessible to the public through a road directly connecting national highway. The The name Bhimbetka is derived from Bhima Bethka(Bhima’s Lounge) as Wakankar took it as the place where Bhima, one of the Pandava heros of Mahabharata, stayed for some time. I have listed the caves as per the number given by ASI (Archaeological Survey of India) for comfort of the visitors. Alongwith this simple numbering, I have also given the three-tiered numbering of V.S. Kakankar, for our more experienced readers. Cave 1 (No III F-23) – This shelter is about 20 m high and overhanging rock is balanced on a narrow base. This shelter has seen major excavations carried out by V.N. Misra between 1973 and 1976, exposing nearly four cultural deposits with the evidence of human occupation from late Acheulian to the end of the Mesolithic period. This shelter has only a few depiction of paintings mostly of historic period. Painting of two elephants on upper ceiling is worth noticing. The smaller elephant is driven by a man sitting on its back, holding a goad in one hand and a spear in another hand. He is also carrying a sword in his waist. Both the elephants are shown with long uplifting tusks. Cave 2 – Not many paintings are there in this shelter, and those remaining are pretty faded as well. We see a painting of an animal (shown here), which looks like a horse however not a horse particularly. It could be a cricket or a grass-hopper as well. What is clearly seen is that it has four legs and large back. There is shown a mane on and near the neck. Cave 3 (No III F-24) – V.S. Wakankar named this cave ‘Auditorium’ as it is 39 m long and about 4 m wide and 17 m high. It has four openings, two each on east and west end. At different places in this cave, paintings of various shades are noticed, most of which are faded now. Seven species of animals including leopard, deer, oxen, buffalo, antelope, tiger, elephant and unidentifiable animals are depicted in this cave. The most attractive depiction is a group of 17 figures (as shown in attached picture) seen over the older faded line drawings on a steep rock face in a corner near the southwestern entrance. In this composition are shown two bulls, two buffalos, three deer, three antelopes, a tiger, a peacock, a left hand print, an unfinished basket like object and two patches of color are clearly visible. Cave 4 (No III C-50) – Popularly called ‘Zoo Rock’, this is a semicircular shelter with large projection measuring 14 m long and 6.2 m in width with opening height of 3.4 m. This shelter has large number and variety of naturalistic and elegant animal paintings. The shelter is richly depicted with as many as ten layers of superimposed figures, most of the figures belong to Mesolithic period except a few that belong to Chalcolithic and Historical period. There are 453 figures in this shelter comprising 252 animals of 16 different species, 90 humans engaged in different activities, two rodents, one bird, six decorative designs, two enclosures identified as snares, on inscription in Sankha script and 99 fragmented figures. There are 83 unidentifiable animal figures. Cave 5 (No III C-43) – This shelter has a main chamber and a smaller cell above it. The painting depicted in the cell are well preserved and belong to the Historic period. This includes bands of armor-clad soldiers and cavaliers in stylized forms (show here in picture). It is the only shelter where the drawings of fowl, scorpions and centipedes are depicted. There is a scene of seven cavaliers accompanied by three foot soldiers, a horse, an old woman, a panther, a jungle fowl, two chicks, and a centipede. Towards the right are six human figures standing arm in arm. Cave 6 (No III C-48) – This shelter contains beautifully depicted natural looking animal paintings in white color. Besides there are figures of dancers (shown in picture here), drummers and horse riders. To the extreme left eight stick-shaped men are shown dancing arm in arm. Below this are drummers, a dancer and little further away another group of three dancers. Cave 7 (No III C-47) – All the figures in this shelter belongs to Historic period. One can see the figures of a swordsman riding a caparisoned horse on the ceiling. Below there is the depiction of a row of horse riders (shown in picture here). To the right row of deer is shown in stylized form. Cave 8 – This cave has many paintings in white, on many superimposed surfaces. Many animals and birds are sketched here. We see chickens, scorpion, horse with riders, deer, stag, dog etc. All painted in white and are superimposed on other figures. Cave 9 (No III C-30) – A wavy design is painted in yellow, green and red on ceiling to the left corner (shown in the picture here). To the right is a floral design in yellow and green color. Further right, there are nine dots and a flower pot with three white lotuses, two buds and two leaves in green. A horse whose rider has faded is on the right of the flowerpot. Higher up, near a narrow passage, there is a deformed figure of an elephant followed by a shrouded human figure. Cave 10 (No III C-29) – On the inside wall to the left there are depictions of a bird on a tree (shown here in picture), a swordsman, a deer and eight figures of drummers and dancers all painted in white. Further below there is the depiction of a horse rider, a king worshipping Shiva-lingam and Nandi and Ganesha, all shown in red color. Most of these figures are quite dull and only careful observation can help identifying these. Cave 11 – This cave depicts many horse-riders with sword and shields, standing in front of soldiers on foot. This looks like a scene of a war (shown in the picture). Some humans soldier figures are carrying a long spear and a round shield. A horse is shown in dynamic movement, starting with a single horse and converging at a figure of a horse with rider. Cave 12 (No III C-21) – This huge shelter has a ceiling about 5.6 m high. There are two depressions on the southern rock face. In the first depression a buffalo with large horns is painted. To its right is the depiction of a galloping nilgai. Below are shown two men. Four fleeing chital are doe in a vertical row are depicted as if they are being driven down from a high cliff. Below to the right a man carrying a bow and sling is shown running after six galloping animals. Higher to the right is a triangular composition in which 19 bewildered buffalos are drawn in dark crimson lines. 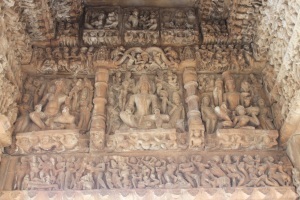 An attractive composition of 38 figures (shown here) is to the right below a shallow overhang. The main figure is of a buffalo around which langurs, chinkara and chital are shown frolicking. A female boar with two offspring and three rows of 14 fleeing chital is depicted below the buffalo and langur. Cave 13 – This shelter contains some faded figures painted in red. A human figure is standing on square flat form, which seems like a back of an animal (shown in picture here). However the animal is not drawn perfectly. It has a trunk and a tail, as well four legs, thus it might be an elephant. Near this figure are some very faded figures, which cannot be recognized fully now. Another face of the rock depicts some animal figures of elephant, cow and deer. There is a human figure with a spear standing upper left of the animal figures. Cave 14 – This cave has a figure of a boar and a figure, which perhaps is a rhinoceros. Cave 15 (No III C-19) – This mushroom shaped giant rock has a large silhouetted figure of boar like animal on its western face. This mythical animal (shown in picture here ) is shown with two crescentic horns, a massive snout with mustaches and bristles on the back. Near its snout is the figure of a fleeing man and in front of it that of crab. There are three human figures near its forelegs and fourth behind its hind legs. Lower down to the left are three animal figures. Two of them are overlapped by two figures of deer and third probably is of a swamp deer stag. Food and Accommodation – MP Tourism runs a very nice and small hotel, Highway Retreat, at the entrance gate of the Bimbetka on Bhopal-Hoshangabad National Highway. Caves are some 3 km from this spot. This hotel is the only place to get food in near vicinity. As Bhimbetka is only 46 km from Bhopal, so better stay at Bhopal and plan it as a day-trip. How to Reach – Nearest main railhead and airport is Bhopal. Bhimbetka is 46 km from Bhopal on Bhopal-Hoshangabad National Highway No 69. The entrance gate is at highway only, near a railway crossing. From this crossing, caves are some 3 km up in the jungles via Bhiyanpur village. There is no conveyance available from this railway crossing to reach the caves, however you might trek this distance in good weather. Getting your own conveyance would be comfortable.